The large viewing screen and robust multi-media capabilities make PSP one of the most popular game consoles and excellent video players. For these reasons, many users would like to enjoy videos directly on it. However, you may be frustrated when you try to download YouTube to PlayStation Portable as a result of incompatibility of video formats. On this occasion, for sake of watching YouTube video on your PSP successfully anytime anywhere as you like, you need to convert YouTube FLV video to PSP friendly format like MP4. As a matter of fact, to download YouTube footages to PSP is quite a piece of cake provided you own a professional YouTube videos to PSP converter. MacX Video Converter Pro offers the adequate format specifically for PSP like MP4, AVI. It is the most powerful and efficient YouTube to Sony PSP converter that can download YouTube to PSP with high output quality, thus enabling you to watch YouTube video on this game console without limitation. Besides the primary function to encode YouTube HD/4K to PSP device, this YouTube to PSP converter also helps to transcode among SD and HD videos like FLV to MP4, AVI to MOV, MKV to AVI, etc. and transfer YouTube video to iPad (the new iPad Mini included), iPhone (iPhone XS/XR/X/8 included), iPod, Android, etc. Therefore, you can enjoy YouTube on your portable devices whenever you want. First of all, you need to download YouTube to PSP converter on Mac and install it, click "YouTube" button, then copy and paste the YouTube video URL. Once you click "OK", the rest video downloading job will be automatically done by this YouTube video downloader. Select the output format you desire. If you want to watch your YouTube video on PSP, you can choose "to Sony" as your output format. What's more, the default optimized video settings make the output video looks great on your player. Click the "Browse" button to specify output folder on your computer to save the output files. After finish the above steps, click the "Start" button to start YouTube video to PSP conversion on your Mac, you could view the conversion progress and are able to cancel the converting process at anytime. More than expected, this video converter also lets you import videos from HD-camcorder to iMovie, iPhone, iPad, iTunes, etc, for it fully supports AVCHD, MOD, TOD, MTS videos recorded by HD Panasonic, Canon, JVC and Sony. Why do you still hesitate? Download and begin the enjoyment now! 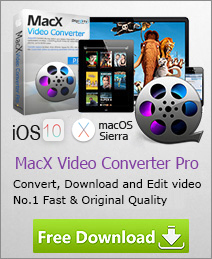 Note, MacX Video Converter Pro is especially designed for Mac users. For windows users, you can take MacX Video Converter Pro for Windows. Wanna Convert YouTube Video to MP4 on Mac? This article will guide you how to convert YouTube video to MP4 on Mac for playback on PSP, iPhone, iPad, iPod, Android, etc. This guide article will show you how to download video from YouTube on Mac using all-in-one Mac video converter. With this guide, you will also know how to convert YouTube videos to iPhone, iPad, PSP, Samsung, etc with Mac.